Have you ever packed everything into the car for a vacation, pulled out of the driveway, accelerated up on to the freeway, and suddenly realized that you had remembered everything except for. . . the children? Have you ever bought a used car only to find out after signing the paperwork that the engine was missing? Sometimes with all the details, it is easy to forget about what is essential. In some ways, this is what has happened in our parenting in this modern civilization. Sometimes, it seems that we have remembered everything, except for what is vital. The book of Proverbs in the Bible is dedicated to the subject of training the young man or young woman. It is full of character lessons communicated to a son by his father and mother. Actually, there is far more in this book than character lessons. It presents a penetrating and powerful methodology for education. 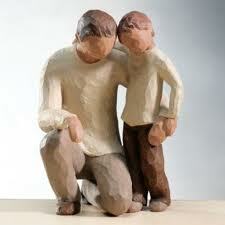 It is education rooted in a relationship, carried from the heart of a father to the heart of a son. The father’s teaching is caring, intimate, open and honest, even desperate and demanding at points. He instructs, warns, encourages, admonishes, exhorts, pleads, and reasons with his son. The son whose heart is bent towards his father does not recoil from his father’s standards and directions, assigning it to the uncool and the weird. He adopts his father’s values and standards. He respects his father and follows his father’s teaching, especially as his father teaches and applies God’s Word. How easy it is for the peer group or some small group of media or cultural elites to set a young person’s values, standards, and loves. When this happens the peer group becomes the authoritative mentor, displacing the father. The peer group is honored and loved, over the father. This is seen when the younger generation throws off the counsel of their fathers, especially in the area of cultural standards, language, and faith. There is probably no better example of a father-son relationship described here than the father of the greatest missionary of the 19th century, John Paton. Repeatedly throughout his autobiography, John referred to his father’s influence on his life, with statements like, “Once more I commited my future to the Lord God of my father.” For almost 60 years of his life, his father led family worship twice a day. In this son’s words, “How much my father’s prayers impressed me, I can never explain, nor could any stranger understand. When on his knees and all of us kneeling around him in family worship, he poured out his whole soul with tears for the conversion of the heathen world to the service of Jesus, and for every personal and domestic need, we all felt as if in the presence of the living Savior, and learned to know and love Him as our divine Friend. As we rose from our knees, I used to look at the light on my father’s face, and wish I were like him in spirit, – hoping that, in answer to his prayers, I might be privileged and prepared to carry the blessed Gospel to some portion of the heathen world.” Here was a man who successfully passed a vision to the heart of his son. In so doing, he passed a vision on to the world through the influential missionary work of his son, John Paton. The son who has given his heart to his father can receive instruction such as what you find in Proverbs 6:20,21: “My son, keep thy father’s commandment, and forsake not the law of thy mother: Bind them continually upon thine heart, and tie them about thy neck.” This son accepts the godly instructions of his father and mother, because it is the truth conveyed through his parents that God has given to him. He embraces these commandments and ties them continually about his heart and around his neck. To some of us this sounds a little like a fantasy world. We have drifted far from the moorings of a biblical culture. But that only makes the issue even more relevant. Our hearts cry out again for the hearts of our children. For we sense that these relationships have drifted apart. There are two ways that the hearts of parents and children are separated. First, the hearts of the fathers (or mothers) may be cut away from the hearts of the sons. This occurs when parents do not have the time to invest in their children. Or they may have time to spend, but the time is hurried. Their minds may be disconnected by lack of margin and by running all directions after all of the screaming exigencies of modern life. This may also occur when we have delegated the discipleship and education of our children away. Or it may occur when we, as parents have given way to habitual sins such as anger, impatience, and selfishness. The only other way that relationships between generations are severed is when the hearts of the sons are removed from the hearts of the fathers. The peer group and the cultural authorities of the day (eg. MTV) often join to form an almost irresistable force to pry away the heart of the child from his parents. Young men and women are easily drawn to the “flakiness” or, as Proverbs puts it, the foolishness of the immature, rather than to the wisdom of their parents. Richard Baxter, one of the greatest Christian writers of the 17th century, wrote, “Bad company is the first undoing of a child.” Not much has changed since Baxter penned those words. This is very helpful advice on raising godly children. I have 7 – three are grown and married now, one is graduated and living at home,and I still homeschool 3 – and it's a blessing to see the serve the Lord. The younger ones are still a matter of prayer, as they and we are still a work in progress. You may want to check out my blog, where I've been running a series on raising godly children called "Lionproof – Protecting Our Children from the Attacks of Satan." Over the years, I've discovered child training patterns of spiritual greatness in many second-generation Christians. This series contains the basics of what I have learned.